The NCAFP Strategic Plan Mission Statement: To advance the specialty of Family Medicine in order to improve the health of patients, families, and communities in North Carolina. 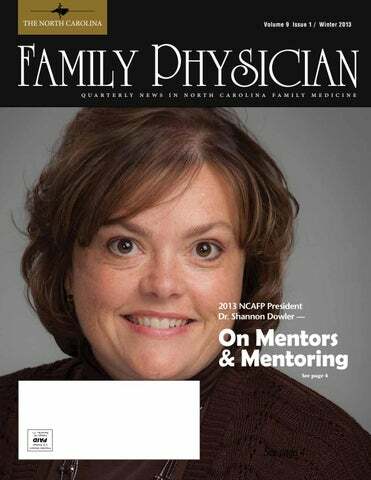 Vision Statement: Family physicians will be universally valued for their role in providing high quality care to the people of North Carolina. NCAFP on December 1st, 2012. Program in Asheville. She is a Fellow of the American Academy of Family Physicians and has served on the NCAFP Board of Directors since 2003. She currently serves as Chief Medical Officer for Blue Ridge Community Health Services in Hendersonville. In addition to her clinical service, Dr. Dowler serves as a trustee on the Western North Carolina Medical Society Foundation. I want to take this opportunity to tell you about myself, because, frankly, you’re a pretty captive audience and I tend a little towards narcissism. It’s not unreasonable for you to have a slight sense of who you have chosen to help lead your Academy over the next year through what will almost certainly be unprecedented times of change, challenge, and innovation in healthcare. Born and raised in NC, I did not travel far to graduate from ASU. I left the mountains to head down east where I spent four very hot years in medical school at East Carolina, now The Brody School of Medicine. Eager to make my way back to the hills, I did my residency here in Asheville and have never left this area. I have spent all 10-years since finishing residency working for non-profits and it turns out that perhaps I am just “one of those people.” I am now and have been for several years the Chief Medical Officer at a community health center in these lovely mountains where I care for a population of uninsured and underinsured, including a large population of migrant farmworkers with a phenomenal group of colleagues in an integrated medical home. When I turn on my ipod it is likely I will hear Eminem, Black Eyed Peas or Donna the Buffalo but it’s almost certain you will never hear country music or Rush. (There is a notable exception to a few Dixie Chic tunes, I confess). Presidential Pinning - Jared Dowler, husband of NCAFP President Dr. Shannon Dowler, places the Academy presidential lapel pin during inauguration ceremonies in Asheville. Dr. Dowler became the chapter’s 64th president. cheese, this was like a window into a world we rarely got to see. Being treated so honorably by someone as important and accomplished as Maureen was monumental. Not to say we didn’t give anything back, of course. I mean, we brought all the ingredients for the apple martinis we mixed table-side for Sue Makey’s retirement dinner! Perhaps what stood out the most to me and continues to impress me, is the genuine joy she seemed to get out of mentoring. Graceful leaders, enthusiastic teachers, role models, cheer leaders…mentors come in all shapes and sizes. As our specialty continues to be in demand and more and more primary care doctors are needed across the state and country, an intentional effort at mentoring will undoubtedly pay itself forward. The time you spend today to guide a student, to offer a home-cooked meal or a fancy dinner out, to listen to the trials and tribulations and offer your words of wisdom from your life experience, the time you spend today could very well be time spent on the next president of the Academy…the next dean of a medical school…the next family doc that sets up shop in a rural area desperate for their care and compassion. With the diversity of ways we practice medicine as family doctors, each of us has the perspective and experience to be that guide for someone early on their path. Lastly, I would add that our need for mentors does not really go away, does it? As I have developed as a physician I have continued to rely on mentors like Susan Mims, who helped me learn how to navigate bureaucracy by modeling grace in leadership. As I explore the world of physician executives, I rely on the knowledge and experience of those who have walked the path before me. Whether it is guidance from Marc Westle on how to negotiate my next contract and to stand up for my worth, or management wisdom on how to coach and develop a physician team from Jennifer Henderson, I continue to rely on and seek out mentors. While I have told many people I was absolutely not going to rap during this speech, I never said I would not rhyme. In closing, In this presidential year ahead I will endeavor to make you proud To lead but be also be led Whether standing or part of the crowd. The good news I’m here to impart Your executive committee is geared We will lead with a good heart I’m sure the membership has nothing to fear. Long suffering Dr. Forrest can relax While Dr. Dennis and I share a stiff drink Dr. Brown will watch our backs poor Dr. White doesn’t know what to think. Greg and Brent may need a big raise I really hope the staff don’t all quit But, hey, what’s a year? A few days? Even they can put up with my… wit. Brace yourself for millennial brains Who text faster than the eye can see Where technology is deeply ingrained Just for playing everyone gets a trophy. They are smart and savvy and quick Finding answers with frightening speed Short term, the answer may not stick, But they are geared to love and to lead. Our academy must take on the charge To get the best and brightest of docs The challenge no doubt it is large But the truth is, our membership rocks So thanks for your vote and your trust Please take to heart my words here today Mentoring’s a choice, but also a must, For our learners we must pave the way. 2014 COMPLIANCE DEADLINE FOR ICD-10 The ICD-10 transition is coming October 1, 2014. The ICD-10 transition will change every part of how you provide care, from software upgrades, to patient registration and referrals, to clinical documentation, and billing. Work with your software vendor, clearinghouse, and billing service now to ensure you are ready when the time comes. ICD-10 is closer than it seems. CMS can help. Visit the CMS website at www.cms.gov/ICD10 for resources to get your practice ready. At a recent professional training program in Florida for association volunteer leaders and executives, some of the leadership of the NCAFP– President Shannon Dowler, President-Elect William Dennis, our Executive Vice President Greg Griggs and me - arrived looking for some time in the sun and physical activity before the "real work" began. We discussed a number of options, before deciding that we would rent kayaks and spend some time in the ocean. While we were really intending to unwind and just have some fun, reflection tells us that we learned some valuable lessons from this experience. I thought I would share them with you here. 1. Sometimes you just have to get in the water. Before our kayak excursion, there were mixed feelings and different levels of enthusiasm among the group. Ultimately, everyone agreed to proceed. Within minutes our feet were wet, and even the most reluctant among us gained confidence and began to appreciate the experience. The same could be said for us as Board members and physician leaders. We all have different interests and wishes, and varying factors pulling us in other directions. Initially we may balk and hesitate at committing, but when we eventually do and join the group (in this instance getting involved in the NCAFP), good things can begin to happen. 2. Have a map. Before we set sail, we received some brief instructions and were told where we should paddle, and that we would find a calm cove to explore just down the beach around a point. As an Academy, often we wonder where we should be going, and even more so, what we might find as we explore new territory. Should we even go here, or there? While there will always be surprises and unknowns, we have a Mission Statement and a Strategic Plan. We discussed over the weekend the need to reexamine them, and make sure they are still relevant and complete. We decided to proceed with a member survey, to give us guidance and direction. We have to have a map. 3. Stay balanced. We quickly learned that kayaks are lightweight, at times wobbly little vessels, and staying balanced in the craft was first priority. Tipping over was relatively easy. Our Academy has many initiatives and priorities, from CME to Advocacy to Practice Enhancement to the Health of the Public. Occasionally - due to pressing issues, or board interest, or other developments - some of these tend to take precedence over others, diverting time and resources. Of course, this is not all bad and often necessary. Along our journey though, we should always be aware of our balance, making sure we are always paying enough attention to all of our values and members' needs. 4. Keep paddling. Kayaking can be tiring. And sometimes you have to stop and rest, and appreciate the beauty of nature. But to get to the destination (and to get back to the hotel !!!) you simply have to keep paddling. Our members and our patients are depending on us to do just that. Board service is rewarding but takes time and energy away from practices and family. Let's not forget to thank each other. excursion. We had gotten the exercise we wanted. The next morning, a comment or two was made about sore arms and backs. But we all agreed the trip was worth it. As we deal with unpleasant and difficult issues, even disagreements among ourselves, we will benefit from the process and be stronger as an Academy. 7. We all have different skill sets. Some of us had spent time in a kayak; some of us had not. Some of us were faster; others were slower but very consistent. Some of us were more observant of nature's wonders; others pushed ahead with a destination more in mind. Like our Academy staff and our Board, we need to recognize those strengths and special skills and make sure we tap into all of them. We are very fortunate to have the talent we have among us. 8. We are better together. As we started out in our kayaks, it was soon obvious that some of us would be faster than others. That was fine - it was not a race or a contest. But without even discussing it, we functioned like a group should. When one member struggled a bit, another dropped back to keep them company. When someone got ahead of the pack, they looked back periodically to make sure the others were OK. Our Academy is diverse, and individuals are and will be at different places both personally and professionally. Knowing where each other are, and being a team, makes the whole better. 9. "Kayak" can be spelled forward and backward. "Kayak" is a palindrome. Like radar, racecar, and civic, the word reads the same going in either direction. We talked over the weekend about the responsibility of Board service and that at times, each of might be in a situation where we hold differing views on an issue than the majority or in contradiction to the Academy's official position. We discussed the importance of speaking with one voice with clarity and conviction. That goes for the most experienced board member to the newest addition. While conflict can be good and healthy, outside the board room, we need to represent the Academy and our members with a unified voice. 10. It is about the journey, but also results. We embarked on our kayak outing because we knew we needed to unwind and get some Vitamin D before the "real work" began. It turns out, as described above, some "real work' was accomplished as we learned more about each other and bonded as friends. The "journey" taught us much. But as beneficial as the outing was - and as enjoyable as board service and attending meetings can be - we have to produce results. Our tasks are to educate physicians, help transform their practices, promote health and better management of disease, and help craft legislation in the best interest of our members and our patients. At the end of the day, the results we achieve are most important, and make the journey even more worthwhile. CD and Online Versions available for under $200! Cost Effective CME For Family Physicians by Family Physicians Print Subscription also available North America’s most widely-recognized program for Family Medicine CME and ABFM Board Preparation. It’s always easy to want a quick fix. In fact, many times we’ve looked for that rapid return on investment and seen our bubbles burst. Sometimes we simply need to remember those stories from our childhood: in this instance the story of the tortoise and the hare. The hare wanted quick rewards and always seemed to get distracted by the new bright and shiny object (could this be the latest test or newest procedure). In turn, the tortoise was slow and steady always focused on the ultimate prize (quality/effective, low cost healthcare led by primary care physicians). We all know the outcome: the tortoise ultimately prevailed. And I think that is exactly where we are heading. I recently began to relate this story from our collective childhoods to the current status of primary care. We would like a quick fix to an upside down system that values procedures over prevention, diagnostic tests over listening to your patients. You, as family physicians, have long deserved to get the accolades/the spoils of victory, but yet are still under-valued and underpaid compared to your specialist colleagues. But I believe times are changing. A few years ago, one of your Academy presidents wrote that he believed the “worm was turning” to primary care. And I think he is right. Maybe not quick enough, but it is turning. We are nearing that tipping point. But now, more than ever we cannot get distracted by those bright and shiny objects or the desire for a quick return. We must remain focused on providing effective prevention, better chronic disease management and lower costs: patient-centered care. That doesn’t mean doing things just like they have always been done in the past. It means we must focus on better population management. We must provide better access. And we must use our healthcare teams differently than in the past. But our state is much better positioned than most, and our physicians have led the way in obtaining national quality recognition. But don’t become discouraged if the awards are not as quick to come as they should be. Because I truly believe they are coming. key components of redesigned primary care. What do they mean by redesigned primary care? It’s simple: The Patient-Centered Medical Home. And what is one of the leading states for PCMH recognition? North Carolina, of course. • As another example, Blue Cross and Blue Shield of North Carolina highlighted several networks of primary care offices, including Key Physicians in the Triangle, when announcing a new lower cost health insurance plan. BCBSNC cited the smaller, more streamlined network of high-quality/low cost providers as a key method of helping consumers control insurance costs without sacrificing benefits. And while BCBSNC is able to offer this coverage at about 15 percent less compared to similar plans, they are also providing higher payment for the participating primary care practices, focusing on practices that have received PCMH recognition. What does it mean: insurance consumers win and primary care practices win. We must remain focused on providing effective prevention, better chronic disease management and lower costs: patient-centered care. That doesn’t mean doing things just like they have always been done in the past. It means we must focus on better population management. We must provide better access. And we must use our healthcare teams differently than in the past. • Finally, Cornerstone Healthcare in the Triad is being touted nationally as a group of physicians, with a foundation based on primary care, working together to improve quality and lower costs. Cornerstone is involved in both public sector (Medicare) and private sector accountable care organizations. The bottom line: don’t be discouraged because the system isn’t moving to primary care as quickly as we all know it should. For in the end, I truly believe – just like the tortoise and the hare – the slow and steady will rule the day. Keep working to transform your practice. Keep working to add value by improving quality (among entire populations). Keep working to provide better access. Then your day of victory will certainly come. A.M. Best has awarded Medical Mutual’s professional liability coverage the highest rating of “A” (Excellent) for nine consecutive years. 2013 Spring Family Physicians Weekend Thursday, April 4 – Sunday, April 7, 2013 GO’IN GREEN!! All Spring Meeting syallabus and educational materials will be provided as a download. A lawsuit can make any physician feel anxious. That’s why MagMutual’s personal handling of each case is so important. And that’s also why we have started the Doctor2Doctor Peer Support program. This program connects physicians in litigation with MagMutual-insured doctors who have been there before. Doctor2Doctor is just one of MagMutual’s physicianfocused programs. To learn more call 1-800-282-4882 or visit MagMutual.com. Insurance products and services are issued and underwritten by MAG Mutual Insurance Company and its affiliates. twenty-first century health care upon the foundation of twentieth-century training. Today's physician trainees enter a world of teamwork and collaboration in health care delivery. The growing demand for primary care coupled with our aging population mean that physicians can no longer care for their patients within their silos. To meet the needs of tomorrow, we must serve as leaders of multidisciplinary teams and continue to decentralize certain responsibilities. We have seen the positive impact of this team based model within patient-centered medical homes across the state, but we are still only scratching the surface of what is possible. Further, we must continue to engage trainees in systems development and quality improvement. We should also look to continue to find ways to balance service with education in the longitudinal structure of residency programs. These goals will continue to streamline and advance the process of developing a successful and productive family physician in modern health care. The kind of family doctor that is best for his patients, his community, and his profession. But these changes cannot happen within medical education alone. There are countless family physicians in their early to mid-careers that should develop new skills to adapt to the needs of tomorrow. We cannot afford to wait for an entirely new cohort of physicians. To truly transform Family Medicine, we must bring opportunities to all physicians interested in adding these skills to their black handbag. What is your residency program, community clinic or practice doing to meet these challenges? What tools are you working to add to your black handbag? Collaboration and the open sharing of new ideas, accomplishments and failures are crucial to our efforts to collectively advance family medicine. Please send us your thoughts and share your views at residentdirector@ncafp.com. Tracking Continuity - UNC Residency Program Director Dr. Cristen Page highlights how the program tracks patient continuity per each resident. Adaptability is perhaps the most important clinical trait for a family physician. To foster and ignite this requires extensive ongoing education, but also the freedom for a physician to pursue their own areas of interest. UNC devotes weekly structured learning time using small group and seminar style techniques of teaching that cover topics ranging from cardiovascular health to preventive care. Hendersonville FM Residency Partnering to Create Teaching Health Center The MAHEC Hendersonville Family Medicine Residency program will be expanding its program through a new consortium consisting of MAHEC, Blue Ridge Community Health Services and Pardee Hospital. The collaboration will create western North Carolina’s first teaching health center and enable the program to expand by one training slot through 2016. The program’s expansion is being made possible through grant dollars available to MAHEC by the Accountable Care Act’s “Teaching Health Center” program. Coinciding with the expansion, the program is also shifting its longitudinal ambulatory training to two clinical sites operated by Blue Ridge, a federally qualified health center, thus establishing the first teaching health center in the region. FM Scholar Patrick Williams of ECU Receives Dr. Lynn Hughes Scholarship In honor of Dr. Lynn Hughes, the Cabarrus Family Medicine Residency Program decided to start an annual scholarship for the Cabarrus Family Medicine mission trip to San Juan De La Maguana, Dominican. Dr. Hughes practiced otorhinolaryngology in Concord, NC, for over 40 years. Dr. Hughes had an ongoing relationship with the Clinica Christiana in San Juan de la Maguana, which is in a medically underserved area of the Dominican Republic, close to the border of Haiti. Dr. Hughes performed thousands of ENT surgeries over the 20 plus years that he made mission trips to the Dominican Republic. Dr. Hughes has also been a lifelong advocate of Family Medicine, and was a strong voice in establishing both the Department of Family Medicine at CMC – NorthEast, as well as an advocate for the Cabarrus Family Medicine Residency Program. Start thinking about this now. Many positions require Chapter Support. All candidate information is provided to the NCAFP Executive Committee for review. This committee makes the decision on whether or not to support individual candidates. Please note, the process of review is the same for all national positions whether you are a student, resident or physician. In honor of Dr. Hughes, the Cabarrus Family Medicine Residency Program has established a scholarship program, whereby two students from the ECU/Brody School of Medicine will be awarded $500 each to participate in the annual CFMRP mission trip to San Juan de la Maguana. This year, the recipient of the 2012 Lynn Hughes Scholarship was Patrick Williams. Patrick is a native of Hickory and a 4th-year medical student at ECU. His is a Family Medicine Scholar in the program’s inaugural class and will be MATCHing into Family Medicine later this Spring. Congratulations! NC FAMPAC FORERUNNER Now more than ever, NC’s family medicine community must support and educate legislators on both sides of the aisle. FAMPAC Family Medicine Forerunners help make this happen. As a Family Medicine Forerunner, your contribution of $100 each quarter (just over a dollar a day) to NCAFP’s Political Action Committee (FAMPAC) helps family medicine keep its voice heard and our issues recognized in the NC legislature. The Academy’s governmental affairs team is keenly aware of these changes and has created a policy framework to guide its efforts this session. In short, your Academy will work to advance physician-directed and primary care-centric healthcare delivery as the basis for overall health quality improvement and cost management. Several inter-related efforts on issues such as NC Medicaid, supporting Community Care of NC, the roles of primary care in Accountable Care, scope of practice, and health workforce development each feed back into this framework. Additionally, your Academy will support public health initiatives related to the core tenets of Family Medicine. Throughout this session, the Academy expects to call upon members to connect with their respective state Senate and House members to communicate our positions. This year more than ever, Family Medicine’s voice must be strong, clear and unified. Please consider participating if called upon to act. Advocating in this way only takes a short amount of time, but is known to pay big dividends as policy is being considered and acted upon. Another way to participate is with you checkbook. The Academy’s Family Medicine Political Action Committee (FAMPAC) is North Carolina’s only PAC dedicated specifically to the issues important to our specialty. Funds generated through member contributions help us to financially support legislators who show leadership on issues important to primary care and Family Medicine. Giving is easy, simply visit www.ncafp.com/fampac.